Expertise in cable media buying is worth its weight in eyeballs, in terms of grabbing the eyes, the imagination, and (ideally) the business of your ideal target audience. But to take full advantage of cable TV media buying without blowing a hole in your budget, you need to understand the difference between geographic targeting, or “zone coverage,” and full market coverage – and how you can maximize your advertising dollar by choosing between them wisely. 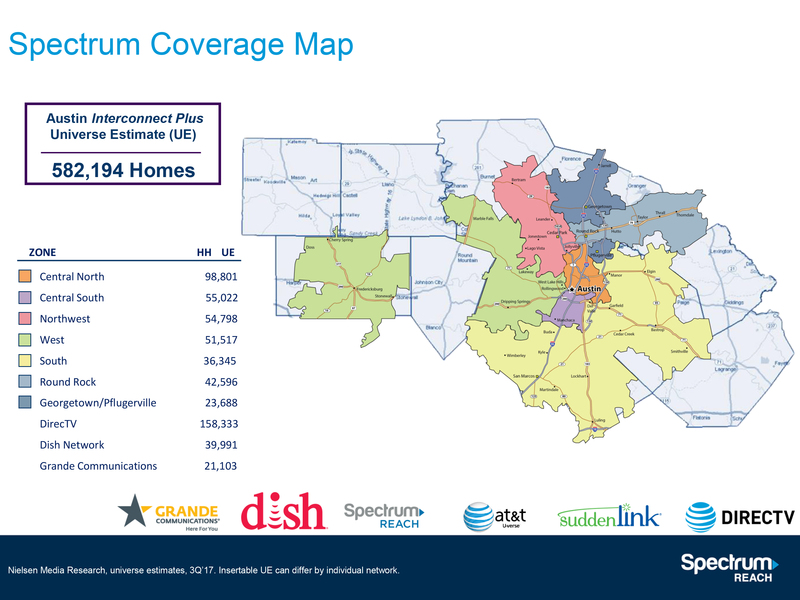 The Austin area breaks its cable coverage into 9 different geographic zones. Some of these zones overlap with others to give media buyers plenty of options as to their preferred regions or communities. This is especially helpful for business that depend on their location as a selling point. Doctors’ offices, gyms or fitness clubs, restaurants, et cetera know that most of their regular customers live nearby. It only makes sense to direct their advertising efforts toward those specific folks, as opposed to broadcasting to everyone in the Austin area through full market coverage. But what if your business really does need full market coverage? You might assume that your most cost-effective move is to buy full media coverage as a “volume purchase” instead of purchasing the zones separately. But what very few people realize is that cable TV media buying in Austin doesn’t actually work that way. The sheer popularity of full media coverage makes it expensive. Some 80 percent of national advertisers and 60 percent of local advertisers fight for TV time by purchasing this form of coverage, creating a shortage of availability that drives prices up. This means you can actually save 20 to 30 percent by creating your own full market coverage – simply by buying up the individual zones at their lower rates. You’ll miss out on some networks that are only offered with a full market package, but you can still grab a city-wide audience through the highly popular shows and networks included in the various zones.